In spite of the phrase “poker strategies” being in the title, this book really isn’t about poker strategy, it’s rather a collection of stories and hands from professional poker. 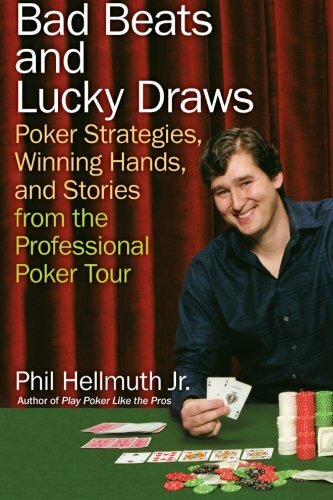 Given that Hellmuth is so preoccupied with bad beats and lucky draws, it’s appropriate that this is included in the title, and in fact many of the stories involve bad beats that other players have laid upon Phil, giving him a further opportunity to rant, with his readers hopefully feeling his pain with him. So I want to evaluate this book in terms of its entertainment value, as it really is meant to be just entertaining reading, as opposed to his other books which try to instruct but don’t do a very good job at it. So if you’re looking to learn how to get better at poker, this book isn’t for you. If you like to read interesting stories about poker, well in that case it’s not half bad. However, it certainly is nowhere near as interesting as some other similar poker books, especially the ones written by the old timers. There’s not much here in terms of storytelling at all, other than a collection of hands that may seem remarkable but in fact aren’t really that exciting. I will say though that by going through these hands you can get some insight into how some of the pros play, although that really won’t help you much with the games that you play. I’m still giving this one a decent rating and if you like poker stories it’s not half bad really. A lot of people don’t like this book because they don’t like the author personally, but if you can set that aside, you may enjoy it at least somewhat.